This thesis takes as its starting point the challenge of the novelty and uncertainty around the development of a new and emerging science and technology such as nanotechnology and attempts to respond to novelty and uncertainty, visible in the call for the ‘responsible development’ of nanotechnology. 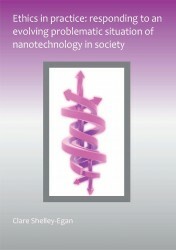 The aim of the thesis is to map the responses, particularly the ethical stances, of scientists and industrialists in relation to the challenge of the novelty and uncertainty of nanotechnology and to evaluate their responses with regard to opportunities and possibilities which go beyond just adding to “organized irresponsibility”. The research questions are addressed through a sociological extension of the pragmatist ethics of American philosopher John Dewey, which couples Dewey’s notions of ‘problematic situation’ and ‘reflective inquiry’ with a multi‐level co‐evolutionary perspective of socio‐technical change in society. The picture which emerges from the empirical analysis underlines the importance of existing roles, repertoires, mandates and institutional contexts in responses to the ‘problematic situation’ of novelty and uncertainty of nanotechnology and the pressure for responsible development in particular. While such ‘tried and tested’ responses may be sufficient as a first and tentative move, they may not be adequate to respond to the problematic situation. Microlevel (individual) reflective inquiry is embedded in meso – level (institutions and sectors) and macro – level (division of moral labour) settings. Thus, if scientists are to pursue reflective inquiry at the micro-level, the shaping effect of patterns and dynamics at meso- and macro-levels needs to be acknowledged. To that end, a multi‐level co‐evolutionary perspective is deployed as a means of identifying building blocks for a more adequate and longer‐term response to problematic situations, which takes into account overall dynamics and the possibilities of modulating dynamics at different levels. Thesis Clare Shelley-Egan: Ethics in practice: responding to an evolving problematic situation of nanotechnology in society (pdf file on utwente.nl, last accessed 16 Dec 2013).